The Cabinet on Monday approved the draft of the ‘National Digital Commerce Policy 2018’ aiming to ensure safe digital transactions removing mistrust of buyers and purchasers in digital commerce. “The government has taken an initiative to formulate the policy for the development of industries, growing export and creating more jobs in the ICT sector,” said Secretary (Coordination and Reform) of the Cabinet Division NM Ziaul Alam while briefing reporters after the meeting. As per the policy, a cell will be formed under the Commerce Ministry for proper implementation of the activities of digital commerce and protection of consumer rights. Ziaul Alam said the policy focuses on ensuring safe digital transactions through the use of ICT, identifying piracy and hacking and checking those, removing fear from purchasers and sellers and enhancing their confidence in the digital commerce. The Cabinet also gave the final approval to the draft of the ‘Mental health Bill 2018’ for making a time-befitting law in the Bengali version instead of the exiting Lunacy Act 2012, said Ziaul Alam. According to the draft bill, if any professional engaged in mental health service intentionally provides ‘false certificate’ over mental illness, the person will be punished with a fine of maximum Tk three lakh or one-year rigorous imprisonment or both. The bill also incorporated another punitive provision for guardians and doctors in case of their negligence in providing treatment to the mental health patients and management of his property. “If any guardian or doctor neglects the treatment of mental health patients or management of his property or doesn’t implement any order of the court, s/he will be punished with a fine of maximum Tk five lakh or three-year rigorous imprisonment or both,” the Secretary said. In the bill, the government has been entrusted with the responsibility of conducting, coordinating, regulating and improving all the activities related to mental health, he said. Ziaul Alam said a mental health review monitoring committee has been proposed in the bill to provide long-term treatment to those affected by mental illness and ensure remedy to any aggravation in this regard. The Cabinet adopted a felicitation motion greeting the Bangladesh women's cricket team for clinching the ICC Women's World T20 Qualifiers title beating Ireland in the final at the Kampong Cricket Club ground in the Netherlands on Saturday last. It also adopted a condolence motion on the death of Saima Huq, elder sister of Law Minister Anisul Huq. Saima Huq died on Sunday. 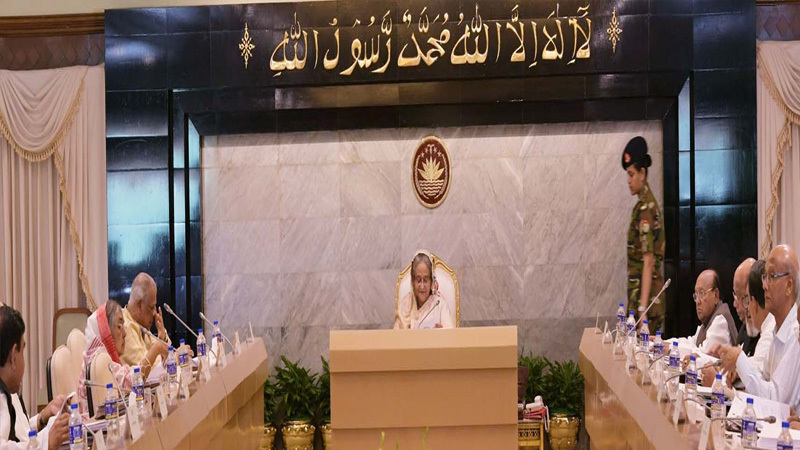 Besides, the Cabinet adopted a thanksgiving motion appreciating Finance Division Secretary Muslim Chowdhury for being appointed as the Comptroller and Auditor General of Bangladesh.